I know I promised Flickr photos but got caught up in Picasa. Click on the picture then on slide show to see some highlights of our vacation. 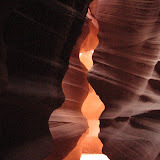 Your pictures of Slot Canyon are incredible! I hope you will do something special with them. Isn't that whole area of our country amazing? (I lived there for 5 years and loved it!). Looks like your vacation was beautiful. You lived there for 5 years, all the seasons. How special. Were you teaching there? Yes, I taught English for 4 years and then was recruited by the retiring librarian for his job...and the rest is history (as they say). That is a beautiful part of our country!